Mac OS X doesn't offer much in terms of comfort when it comes to working with multiple windows. HyperDock can show all the windows from an application when you click its dock icon. It works like in the latest MS Windows versions, where you can preview windows by hovering over their task bar icons, but the application provides a few extra features, to make everything more comfortable. Extracting and running HyperDock's installer is sufficient if you wish to enjoy its functionality, because all the recommended settings are selected by default. If you click a running application's dock icon, its window will pop up in a bubble, directly above the icon. Of course, if you have more than one window for the same application, you will see them in the same bubble. Furthermore, the contents that are displayed on a window will be visible in its preview, which makes it much easier to bring up specific contents on your screen. If you click one of the windows, in the aforementioned bubble, the actual window will be maximized on your screen. It is also possible to click and drag a window preview, if you wish to place the actual window in a specific spot on your desktop. Just like in Windows, you may close individual windows, by clicking an "x" icon inside the bubble. What makes HyperDock different from the Windows preview feature is the fact that you can also open new windows of the same type. Once installed, HyperDock will create a new section in your Mac's configurations panel. It contains a wide range of options, which give you full control over the application's behavior. You can set it to avoid displaying the bubble if an app has a single window, increase or decrease the bubble size, tweak its appearance and much more. 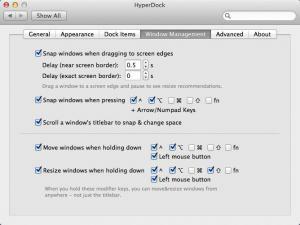 If you wish to work with multiple windows more comfortably, then HyperDock is something you should definitely look at. Besides previewing a window through its dock icon, you can also close it, move it on the screen and open new ones. The application places a wide range of useful customization options at your disposal. You can download HyperDock free here.